An apple cream cheese rustic pie is the perfect fall recipe. 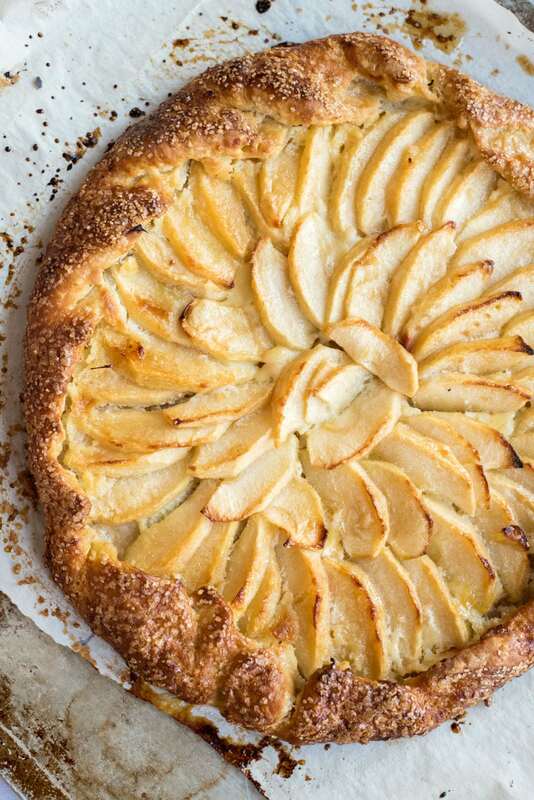 The addition of sweetened cream cheese to the galettes is the perfect match for tart apples. This rustic pie, or galette, recipe is actually a companion to another recipe that you may recognize, my mini apple cream cheese galettes. I thought it would be fun to show you a larger version for another spin on this delicious fall dessert! Depending on the occasion, you can make the small ones (brunch, perhaps? ), or one massive galette (to adorn your holiday dinner table?). These photos have actually been on my computer for a whole year! Sometimes by the time I get photos edited it’s beyond the time when it’s seasonally appropriate for me to post a recipe. 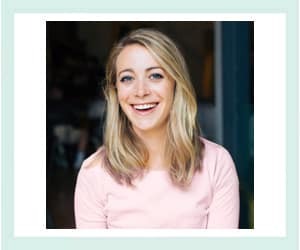 I mean, no one wants to read about fall desserts in March, right? I remember the day these photos were taken. It was the day after Thanksgiving last year and we were in Minneapolis, Minnesota with Pat’s family. We had leftover pie dough, so I thought it would be the perfect opportunity to use it up to make some large galettes. It was fun to get Pat’s sisters involved in the photo styling. They helped me ransack Pat’s mom’s house for props, like a white tablecloth, teacups, and some pretty napkins. They were also nice enough to serve as hand models for the photos! If you follow me on Instagram, you’ll know I love featuring activity in my photos. I just think it’s so much more interesting to have photos capturing the moment instead of just a static styled shot. The rustic pies themselves were also a huge hit! The creamy tanginess of the cream cheese balances out the sweet and tart flavors of the baked apples making them a match made in heaven. You also can’t beat my all-butter pie crust recipe. Just make sure you bake these galettes long enough! They should be dark brown and almost crispy on the outside, with the raw sugar all melted and caramelized, when they come out of the oven. Whether you make them large or small, they are sure to please. 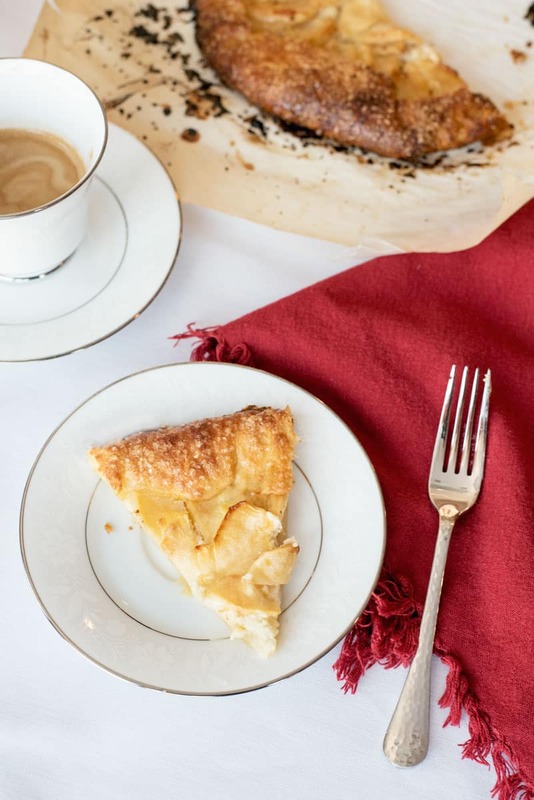 An apple galette is the perfect Fall recipe. 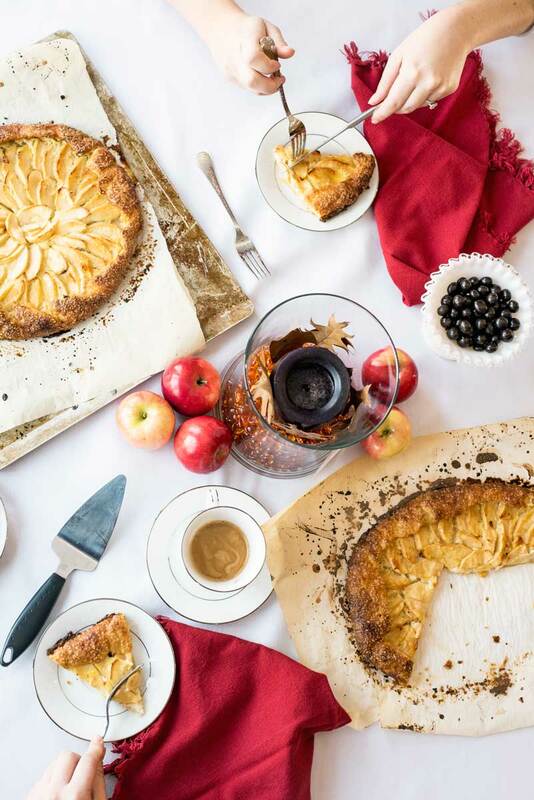 The addition of sweetened cream cheese to the galettes is the perfect match for tart apples. Mix the cream cheese, two tablespoons of sugar, and vanilla until smooth. Divide the pie dough into two. On a floured surface, roll out each round to about 12 inches in diameter. Divide the cream cheese mixture in two and spread evenly on the dough, leaving about a 1/2-inch border. Starting at the outside, arrange sliced apples on top of cream cheese mixture, leaving a 1-inch border. Discard the remaining liquid. Fold the uncovered dough over the apples in an overlapping fashion, leaving some of the center fruit exposed. Whisk egg in a small bowl. Use a pastry brush to cover the exposed dough with a generous coating of egg. Sprinkle each galette generously with Demerara or raw sugar. Bake at 400 degrees Fahrenheit for 40-45 minutes until crust is golden brown. Serve warm or at room temp. To make two large galettes you will need pie dough for a two crust nine-inch pie. This makes me so very excited for Fall!